This year, ILSE has once again been involved in two projects she supported through her donations. 2. ILSE was also contacted by the LRSG (Limpopo Rhino Security Group) This is a non-profit organization that specifically help protect rhinos in private ownership. Protecting these valuable & endangered animals is a very costly project & millions are spent on security, anti-poaching units & the welfare of these animals. ILSE & her husband was privileged to spend a whole morning photographing & observing rhinos on a private farm & the three Black & white rhino paintings that she did was the result. 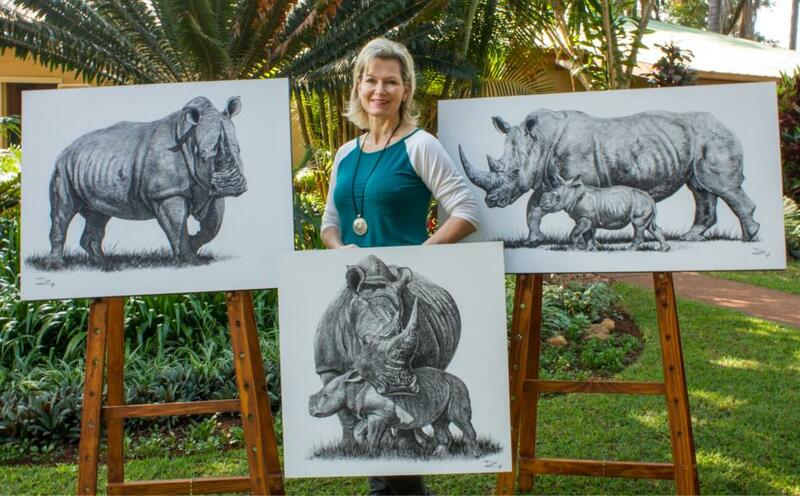 She donated these three original Wildlife paintings to the Limpopo Rhino Security Group & they were auctioned off during a Gala fundraising event in May 2018. The Timbavati Foundation runs an environmental school which provides an interactive environmental education program for primary and senior school children, with training being tailored to the activities, needs and challenges of the communities in the area. Training takes learners out of the classroom and into the bush, and the funds that the Foundation receives are exclusively for direct project related costs, such as the construction of netted gardens, the placement of water tanks, and/or the sinking of boreholes. This inspired me to want to contribute in some way. I had a chat with the management team at Phelwana Lodge. A few months later I met with two of the Timbavati Foundation Trustees to discuss some practical options, and we settled on three black and white paintings that I wanted to donate. These paintings are currently displayed and available for purchase at the exclusive Makanyi Lodge’s curio shop in the Timbavati Private Nature Reserve, and the money from these sales will be channelled back to the Timbavati Foundation. Last year I also visited the Hoedspruit Endangered Species Centre with overseas clients. The center is a unique African wildlife facility focusing on conservation and the sustainability of rare, vulnerable, and threatened species. Cheetah conservation is one of the core disciplines, and I offered to contribute in some way if possible. I was later contacted by the founder of the center, Lente Roode, who annually goes to New York to raise funds for the center. 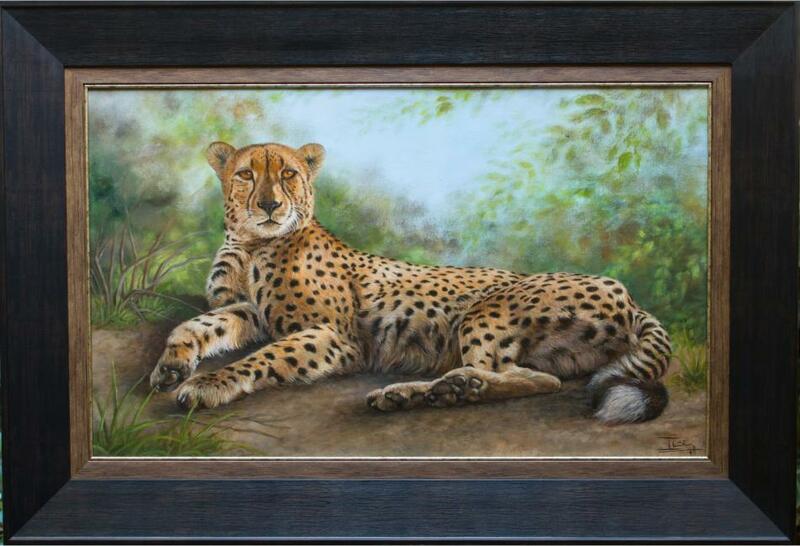 I offered to do a painting of one of the animals at the center that could be auctioned off at one of the functions, and she suggested a painting of a cheetah male, named Crunchie, one of the center’s cheetah ambassadors. We took many beautiful photos of him, and if all goes well, I will paint this beautiful cheetah. Being an artist and creating beautiful lasting images with paint on canvas is, and always will be, my passion and privilege, and like most people I want to make a difference – through my art – no matter how small the contribution may be. 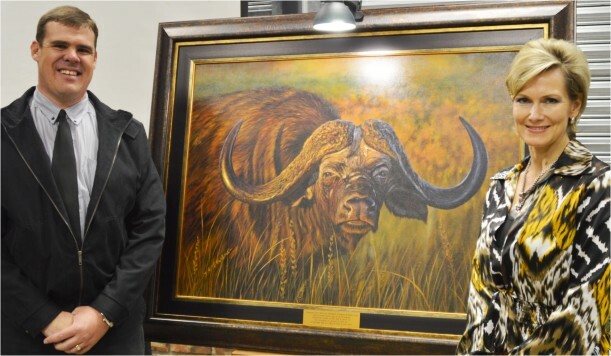 ILSE donated this painting of a buffalo to Ben Vorster Secondary School. The school has a buffalo depicted in their logo. With her is the proud headmaster, Chris Denyschen. Painting donated to Ben Vorster Secondary School. 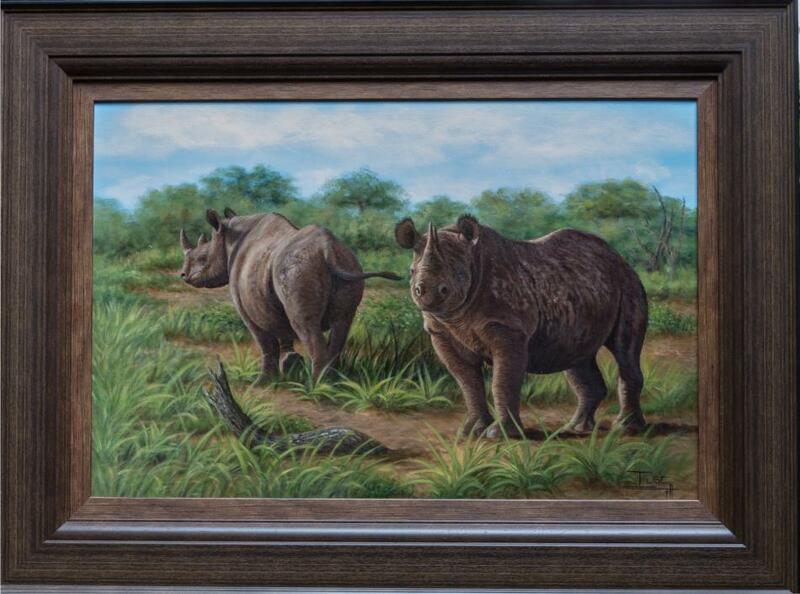 ILSE donated a painting to the Lowveld Hunters society who held a black-tie dinner & auction to raise funds to help the endangered Rhinos in S.A.
ILSE donated a painting to Perth Zoo in Australia. Funds raised from auctioning this painting goes to the Silvery Gibbon-project run from Perth Zoo. These unique primates originate from Madagascar & are highly endangered.